My mother Gudrun Bachmann was born on June 9, 1939. When World War II begun with the invasion of Poland on September 1, 1939, she was less than three months old. When Germany surrendered on May 9, 1945, she was one month shy of her sixth birthday. Besides a treasure trove of family stories from aunts, uncles, grandparents, parents and older siblings, my mother possesses remarkable childhood memories reaching as far back as before her second birthday. 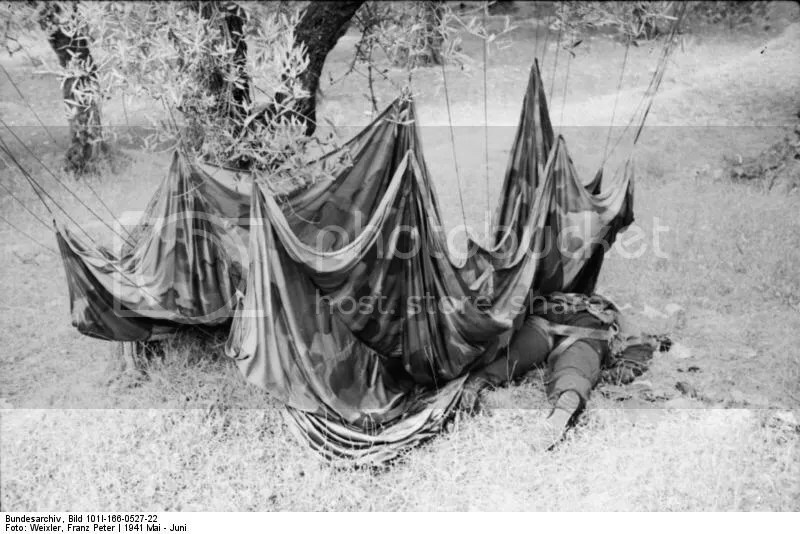 Tonight, I want to tell you about my granduncles Theodor and Emil Fritz who perished in the battle of Crete on May 20, 1941. My granduncle Emil had been arrested twice on the street because he did not appear to be “Aryan.” The first time, Emil had dressed up as a fiddling gypsy while fundraising for the Winterhilfswerk, a charity of the propaganda ministry. I do not know the details about the other arrest. Perhaps, it was sufficient to be short, dark haired, and dark skinned to be suspicious. The family would then have to report at the police station with a family tree to demonstrate the absence of Jewish ancestry. These troubles came to an end when Emil volunteered to become a paratrooper. Emil’s enthusiasm for the paratroopers infected his older brother Theodore. Theodore had been a Lutheran pastor, which would have exempted him from conscription. However, his enthusiasm, energy and success had provoked the jealousy of others who reported him to Church authorities and made his life difficult. My mother remembers that one night, she was allowed to stay up late, perhaps for the first time in her life. Her parents were busily preparing a meal and a dinner table. Then the guests arrived and my mother had to go to bed. Of course, the girl couldn’t sleep. The guests, the talk, the laughter, and the songs were too exciting. That night, my grandparents saw off fifteen paratroopers who only knew that a secret mission was imminent but no one knew when and where it would take place. On May 20th, Emil took off with the first wave. Already on the runway, a commanding officer ordered Theodore to remain behind. The officer argued that he could not burden their mother with the loss of two sons on the same day. Theodore could not bear to stay behind while his friends and brothers were risking the lives in battle and ran along the plane as it was taking off. When he could not get on, Theodore begged another commander to let him on his plane. That plane was shot down by the lone British air defense battery. Although the battle of Crete lasted only for three days, my great-grandparents did not get notified of Theodore’s death for four weeks. By the time they found the plane, the passenger’s bodies were reportedly so decayed that they identified Theodore by the spectacles on his face. As far as one can tell under the circumstances, he appears to have died immediately. Likewise, Emil had been fatally wounded in the air. His comrades found him within feet of the German positions, having bled to death from a gut shot. Reportedly, there was a long line of blood and drag marks that indicated that he had been struggling to reach his comrades. As my great-grandmother had been frail after Emil’s birth, my grandmother had effectively raised him. Margaret claims that the night her brothers died, she dreamed of an open grave. Instead of performed the traditional soldier’s hymn Ich Hat Einen Kameraden, the trumpeter played Emil’s favorite song Nun Hat Es Sich Gewendet, das Grüne Buchenblatt. When the survivors returned, a paratrooper reported that they had indeed played Emil’s song at the mass grave where he was buried. I am not sure if my grandmother prompted him or if he volunteered the information. It appears to be the case, however, that Margaret and my grandfather begun to wear mourning beginning May 21st even the authorities had not yet announced the invasion, much less the associated casualties. Of the fifteen young men who had been guests at my grandparents’ house, none would return alive from Crete. My great-grandparents considered it a blessing that their sons, at least, did not have to kill anyone as they had died at the beginning of the battle. Of course, from our vantage point there is something absurd about that attitude. If killing is the problem, you really should not be a Nazi paratrooper. But it is difficult to appreciate the divided loyalties that one might feel at times of war and few people are as consistent as Quakers, especially not German Lutherans. Regardless, my great-grandfather knew quite well what he was talking about. When the Greeks rose against the invaders, General Student ordered atrocious retaliation against the civilian population, which would have marred Emil and Theodore’s conscience for the rest of their lives. Later, my great-grandparents lost their youngest son Siegfried at the Eastern front, whose story deserves separate attention. If my great-grandmother had been an American, she would have been a triple gold star mother. In 1944, the old couple’s home was fire bombed. When they escaped the house, the clothes on their backs were burning and my great-grandmother’s hair was aflame. They had literally lost everything but they were alive and except for some burn wounds unhurt. To put our losses into perspective, both my mother’s and my father’s extended families were lucky. We did not loose women and children, just men and property. Many other families fared a lot worse, especially, those suffering under German occupation. No man should have to die without having the opportunity to have children. Emil and Theodore remain interred on Crete. Only their sister Lore and one of my mother’s cousins visited their grave side. I have never met Emil and Theodore but I cannot forget them. Although my second hand memories are a poor substitute for their dreams, aspirations, and disappointments, they add value and meaning to my life. Seeing my daughter perform on stage and my son learning the oboe, I sometimes wonder which bit would remind me of their great-granduncles had I been lucky enough to know them myself. This is a moving story well told. A wonderful tribute. So often it is easy to forget that both sides had people just trying to do their best in a bad situation. Thank you, Ronan and Jon. Ordinary people get involved in evil causes. They were not monsters but they were involved in a monstrous cause. Since so many ordinary people were involved in the holocaust, it could have been you and me. Scary, isn’t it? The other day, I heard a well respected academic defend the poor reputation of his community that opposed civil rights with the remark that his parents were good people. That is why his ivy league professors criticism of his community was invalid. Unfortunately, in some ways a good person can contribute more to an authoritarian cause than a bad person. Hannah Arendt was quite right when she spoke of the banality of evil. I feel that this logic applies to cases as different as the current ACORN scandal to the abuses during the so called war on terror. I may be wrong but I would like to believe that it helps if you can be tough on yourself and your loved ones without being judgmental. Yes, it was a tragedy on so many levels, Tim.